Trip Day 3 (cont) : After a few hours driving we reached the Bostwanan boarder crossing which after being fully briefed and leaving camp so early went without a hitch. All we had to do was fill out of forms and join the queue, Justin and our driver Dennis sorted everything else. The lady at the immigration desk was surprisingly friendly and even accommodated my request for the entry stamp on a certain page on my passport (I was try to make sure I had enough pages left to get through all the countries). When we got back on the truck we compared passports and stamps, Luke, another young Aussie, was the most well travelled 21 year old I had ever met, was a little annoyed because they stamped his on the wrong page. His aim was to fill 1/2 a passport by the end of his trip, he was nearly there. As we got going again, heading into Botswana, I introduced a card game called "Bulls***" to the group. Everyone seemed to be obsessed with it and I sometimes wondered if I'd done the right thing by showing people it. Even Justin joins in. Bulls*** is simple really. All the cards are dealt evenly between the players, and you have to put down cards in order from Ace to King whether you have them or not. For example, if person A lays (face down) one ace, the next person either lays down aces or two's. The next person two's or three's etc. If you don't have the cards you have to lie and put down another card(s) e.g. if my go is to put down jacks or queens and I don't have any, I might say I'm putting down "2 Jack's" but really I'm putting "1 Ace and 1 ten". If at anytime you think someone is lying you call "Bulls***", if they were lying they pick up all the cards, if they weren't the person who called Bulls***, picks up all the cards. The winner is the first one to get rid of their hand. Unfortunately during this trip Taylor (Aussie, 18yo) was starting to feel ill and for a fair bit of the journey was throwing up. For lunch we had made sandwiches before we left and stopped off at a Super Spar complex where we could eat. Some people decided to ditch the sandwiches and headed for a nearby McDonalds. Alicia and I did not. Justin spent his lunch break in the pharmacy trying to get Taylor some medicine. Around mid afternoon we arrive at our campsite for the night at Martin's Drift (not too far after the boarder). We put our tents up in the blazing sun, then me, Alicia, Justin and Dennis kick a football around until I am absolutely dripping with sweat. We were supposed to have a swimming pool which would have been perfect but after a little looking round we discovered it was closed for maintenance, oh well, time for a well earned beer or two from the eskie then. For dinner we all help with the cooking and end up having some very tasty chicken and pasta bake. It was far beyond they tinned muss I was expecting us to actually have. At the end of the day Alicia, Luke, Rachel (Aussie, 20 - travelling with Taylor), a newly recovered Taylor and I sit in the campsite bar and watch the African Champions League on a TV. It was a good laugh. Trip Day 4: Cereal, banana and peanut butter on toast for breakfast before packing our tents down and putting our stuff back into the truck. Today we made our way through the middle of Botswana to our next campsite at Elephant Sands national park. Because of the distance, it's another fairly long drive, but at least we know that when we get there we'll have the opportunity for another game drive. Unfortunately Taylor was sick again and slept most of the way on a mat at the front of the carriage. Surprisingly conversation wasn't easily held in the group whilst travelling and a lot of it was spent talking to Alicia, reading, listening to music or in silence looking at the scenery. Lunch was at the side of the side. We stopped under a large tree and unpacked the tables and left over chicken pasta bake from last night. The road was almost deserted, a few cars went by now an again and one pulled up asking for a picture with the girls of the group. The African family didn't get out of the car to join them, but just took a group picture of them before driving off again. At lunch the photo on Facebook is shown to Justin and he was in no way amused. He pulled Zoe aside after lunch and didn't really get too involved with us socially for the rest of the trip. After finishing lunch we left the left overs for some locals that had randomly popped up and had been slowly increasing in number. It was another hour or so till we got to Elephant Sands, but it was an excellent welcome as we were about to turn into the campsite where a couple of wild elephants are dotted about eating at the side of the road (these almost felt more special to see as in Kruger they are restricted/protected by fences. Elephants Sands is a non-fenced national park so the elephants are truly free to come and go as they please). Dennis stopped of slowed Rumphi down so we could all get a good view and photos. As we turned off into Elephant Sands the road was extremely bumpy and made completely of sand, in contrast to the lush soil of South Africa. It reminded us a little of Fraser Island in Oz but bouncy about in such a tall springy vehicle was certainly entertaining. The campsite it's was pretty cool. It had a fresh watering hole right next to the bar so when it doesn't rain for a while this is the only consistent place for the local wildlife to drink. Unfortunately for us it'd rained a couple of times since we started our trip, so the chances of seeing something were slim. Although the animals had fresh water to drink, all the water for visitors in Elephant Sands was salt water (including shower and tap), this is because the water source they use was underground. The campsite was smack in the middle of the game reserve, but the two weren't separated at all, no fences or gates etc. At 3pm we went on the optional game drive. It was $25 and included water and 2 drinks, we choose cider. Our guide for this was "Frank", he was very knowledgeable and wee were just out of reception and he was already spotting tracks in the sand. Unlike Kruger, there were not roads, we just drove over the sand with the least scrub. Now THIS felt more like a safari to me. It wasn't long before we saw a single steenbock (a small antelope) bound away from us but after that it was another hour before we saw anything else. In the meantime Frank was busy pointing out a massive amount of bird life. It didn't interest any of the others but Alicia and I loved it. It was the most amount of bird life we'd seen anywhere on our entire travels (including the Amazon - Africa wins hands down). The next big game after the steenbock was an elephant, then shortly after we spotted another massive bull. As the elephant slowly lumbered away we pulling into the clearing it'd just been in and Frank made the surprisingly suggestion of us getting out of the 4X4 and having a walk around and even open our ciders. Savanna on the Savanna...nice. We milled around in the tall golden grass, took photos, soaked up the surroundings and drank our drinks before heading out to find more game. Unfortunately Sarah (21 yo, Scotland) was physically sick over the edge of the truck shortly after, we just hoped she didn't have what Taylor had - she was still asleep in the truck). So we made a 30+ minute retrace to drop her back off at camp. After leaving her in the care of Justin and Dennis we headed back out again but saw nothing for the next hour or so. Just a long hour spent looking intensely at long grass thinking broken logs might be lions. We stopped for another drink break just as the sun was setting. It made everything light up res, oranges and purples (mainly to clouds). It made a nice moment and was pretty romantic. We drove around some more as the light faded, we even had our headlights on. Just as we gave up because it was getting too dark we spotted two giraffe wandering around! We didn't actually get back to camp until about 7pm having only seen 2 elephants, 2 giraffe, 1 steenbock and 2 ciders. Everyone was pretty down after the huge animal count we had in Kruger. However in hindsight, I really enjoyed the Elephant Sands trip, it was a lot less touristy and more adventurous. The birds we saw were amazing and overall it felt more genuine (or what I thought of as a genuine safari). After Justin cooked as an immense steak dinner - lush - Alicia and I headed down to the watering hole to see if we could spot any animals. We sat by a log fire they'd put in the viewing area for a few hours, most of the bar lights were turned off so it was pretty dark. Unsurprisingly after a few hours we hadn't had any joy with spotting any animals so we got up to leave. As we got into the bar with only a couple of people left in it, Alicia felt something pinch her leg, she looked down to see a massive(!) bug on her leg. It took me 2 full whacks to remove it. The owner later killed it, apparently it was likely to have been a water scorpion. We called it a night after that, cleaned out teeth in the salty water and headed to bed. In the night there was lions roaring which we'd slept through and in the morning Justin pointed out tracks where elephants had walked literally through our camp (only feet away from our tent). Crazy. We spent most of the day driving, stopping only for the usual Spar and toilet breaks whilst we kept ourselves entertained with more Bulls***. WE reached our campsite for that evening called "Thebe Lodge and Camping". We set up our tents near the toilet and shower block and relaxed until around 3pm. At 3 headed to the riverside in Rumphi where we ere going to go on the Chobe River cruise. Everyone wanted more group photos before we got on the boat, all of which meant we almost missed it, they actually just cast off and had to call it back when we arrived. We flung the eskie (cool box) full of beers for the trip on board and headed out on the Chobe (pronounce: Cho-bay) river in a small boat crammed full of seats. The boat reminded me a little of a small tender vessel. It was only 5 or 10 minutes into the trip when we saw a large herd of elephants coming down to drink at the riverside, they were a little tentative ar first, smelling the air for danger by raising their trunks up. Eventually they came down for a drink and a bit of a bathe, they also had a small baby with them that just played in the river, laying on it's side and kicking on the riverbank. We turned the engine off just to watch them for a while. After we moved on we came across another single bull (male) elephant and we beached the boat next to the elephant and unsuspectingly a small crocodile sitting in the grass. 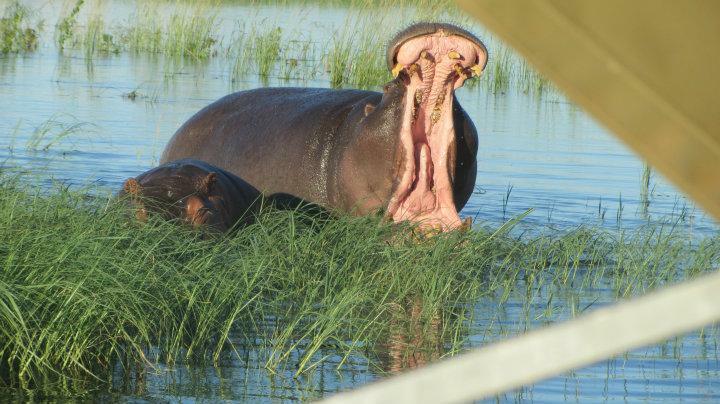 Whilst cruising around we saw our first hippos sitting in the reeds, that was exciting. We saw dart birds (like cormorants) sunning their wings as well as crocodiles swimming in the water only feet from the small boat. We saw a family of baboons come down the riverbank for a drink in the still waters. After which we saw many more hippos yawning and flinging their poo around with their tails, which amused everyone on board the boat. It was nice to see all this whilst sitting relaxed in the hot sun, drinking a couple of cool beers / ciders and watching all this happen around you. You were next 5 minutes without seeing something. Our luck continued with our first real sighting of a water buffalo relaxing in the water with a couple of birds hanging around it. There was a large fish eagle sitting in one of the trees and as we floated around the reeds saw one of the swimming croc's climb briefly out of the water and it was WAY bigger that it looked in the water (where you could just see the end of it's snout, eyes and spine). I was going through my Castle larger for the eskie, but by the end of the trip I was absolutely busting for a pee, I was talking to an older women for another group and she was having the same issue. At least I wasn't alone I suppose, but luckily we were heading back by this point and even some of our group drank for the first time. Back at dock I hopped off and found myself a nearby secluded bush, whilst the others got back on board the awaiting Rumphi. It was really, really enjoyable. Definitely one of the highlights of our African journey and Zoe even went as far to say it was one of the best things she'd ever done. It was pretty amazing.